As we near the 40th anniversary of mankind's first steps on the moon, it is worth remembering the people who supported the recovery of astronauts Armstrong, Aldrin and Collins -- and who helped avoid the tropical storm that could have killed them. 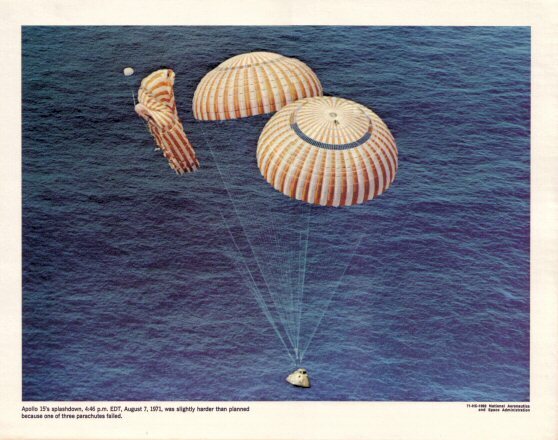 Captain Hank Brandli, a U.S. Air Force meteorologist at Hickam Air Force Base on the Hawaiian island of O'ahu, had irrefutable information that the designated landing site for APOLLO XI's splashdown was in the middle of a forming tropical storm. However, since his information came from a highly classified weather satellite (at the time code-named 417, since redesignated as the Defense Meteorological Satellite Program [DMSP]) that was part of the even more highly classified CORONA reconnaissance program, he could not freely share this information. Fortunately for Capt. Brandli, the Pentagon's chief weather officer at the Fleet Weather Center in Pearl Harbor (CAPT Willard "Sam" Houston, Jr.) was cleared for information on the 417 satellite. Capt. Brandli brought him into the vault to show him the photos, and convinced him that the USS HORNET carrier task force and the returning Command Module would have to all be moved 250 miles to the northwest. CAPT Houston was then able to persuade RADM Donald Davis (Commander of Task Force 30) -- but without being able to divulge "how" or "why" -- that the aircraft carrier that would be carrying President Nixon had to be relocated. Only after President Clinton declassified the CORONA program (in 1995) could Capt. Brandli and CAPT Houston talk about their role in saving the APOLLO XI mission. I was born almost exactly two years before the return of APOLLO XI. In my lifetime, technology has far outpaced our policies for sharing information. Realtime satellite imagery (of far higher quality than the vintage 417 image at left) is taken for granted, with handheld devices (like my bride's new iPhone3G) that have broadband networking capability, multiband communication radios, integrated Global Positioning System and billions of bytes of flash memory storage. If it weren't for Capt. Brandli's perseverance, and the fortuitous fact that he was cleared for the program that could give him a glimpse into the weather five days hence, APOLLO XI would have been a devastating failure -- a national embarrassment as we would have mourned the death of three of our finest astronauts. How many failures can be attributed to the absence of a Capt. Brandli? How many more will we endure due to anachronistic policies and the cultural reticence to sharing information across departmental and agency boundaries?